According to Akan tradition, white is never worn at a funeral because it is a color that symbolizes joy, purity, cleansing and victory. While paying homage to Ancestors, they wrap a special Ancestral stool in white cloth to protect it from negativity. 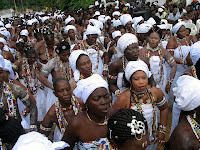 In Voodoo tradition of the Fon kingdom in Benin, white is worn during rituals of healing and cleansing. 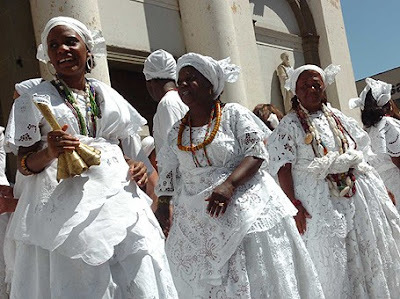 Women as well as men in the Candomble tradition of Brazil often wear white during important spiritual events. White is also significant in Yoruba tradition and is worn for honoring Ancestors as well. So, as our Annual Ancestor Celebration draws nearer, prepare your white clothes and join as a community with those who will be gathering in celebration and reverence to Ancestors. This is a color that will surely emanate the spirit of unity as well as healing that will be important to this year's event. The activities begin at 11:00 am this Sunday, June 16 (Juneteenth) at the Omenala Griot Museum, 337 Dargan Place SW, Atlanta, GA 30310. Lets all wear our whites and wear it well. We will feel at peace with ourselves and victorious over our enemies near and far. Be healed, Be at One. Ire, Ase. White a color of Obstacle and my lineage. I wear it with love and pride!